Pickard Chilton, an award-winning international architectural practice noted for its expertise in delivering high-performance buildings that create value and enhance communities, announced that Project Architect Mohamad Hafez AIA is the recipient of a 2018 Connecticut Arts Hero Award for his extensive and continuous body of work on issues such as the Syrian civil war, the worldwide refugee crisis, and an overall desire to counter hate speech. Hafez was presented with the award and a Certificate of Appreciation from US Senator Chris Murphy during Connecticut’s Arts Day ceremony on April 25. Organized by Connecticut’s Department of Economic & Community Development, the Connecticut Arts Hero Award is an annual recognition of Connecticut residents who are doing extraordinary community work through the arts. The 2018 theme was ‘resiliency’ – how people recover from setbacks, overcome misfortune, and keep a positive outlook in the face of adversity. Hafez was one of nine Art Hero Award recipients, selected from a pool of 165 applicants by a review panel consisting of arts leaders and artists across Connecticut. His latest work, “UNPACKED: Refugee Baggage,” is a multimedia traveling installation that seeks to humanize the word ‘refugee’. Hafez collaborated with writer Ahmed Badr, an Iraqi refugee attending Wesleyan University. 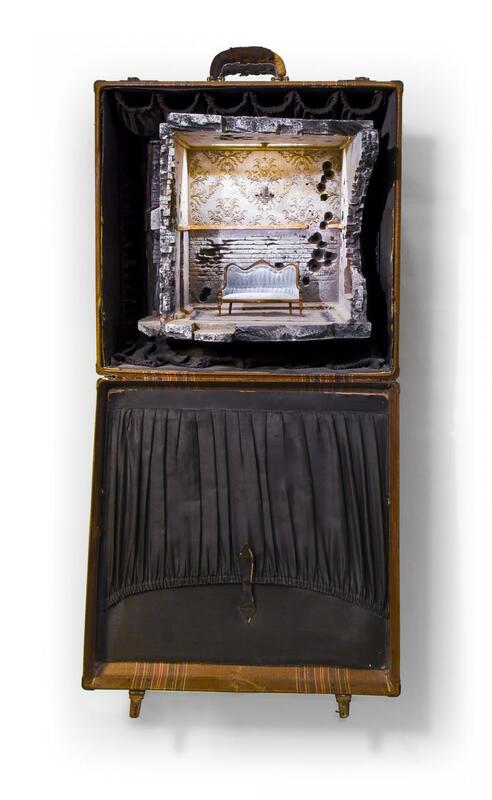 Hafez drew upon his personal experience to create “UNPACKED: Refugee Baggage;” an exhibit which consists of series of suitcases that each feature sculpturally recreated rooms, homes, buildings, and landscapes that have suffered the ravages of war. In viewing the pieces, visitors experience through headphones short audio clips of the voices and personal stories of real refugees from Afghanistan, Congo, Syria, Iraq, and Sudan, people who have escaped to build a new life in America. Visitors can continue reading the stories online and on exhibit placards. Most recently, Hafez served as the Project Designer for 609 Main, a 50-story high-performance office tower in downtown Houston, Texas. An artist and architect, Hafez was born in Damascus, Syria, raised in the Kingdom of Saudi Arabia. He holds a Bachelor’s Degree in Architecture from Iowa State University. Hafez joined Pickard Chilton in 2009 and brings a fresh perspective to the firm’s projects, embodying its culture of idealism and pragmatism, as well as creativity and rigor.